All over the globe certain flowers or plant forms have become synonymous with numerous Holy Days, Seasons, or occasions in many nations. This Holiday season we are saluting Aechmea Mariae-Reginae in all its glorious color and form as our cover feature. Just one year ago (Vol. V, Nov.-Dec. 1955, No. 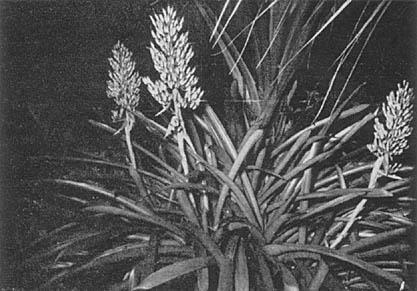 6) we printed a photo in black and white of this same plant as it flowered in the bromeliad section of the Fairchild Tropical Garden in Miami, and in David Barry's greenhouse in Los Angeles, California. How we wish that we could have at least one color plate in every issue of this Bulletin, but the cost is too great for our humble little periodical. This is the second colored plate we have used; we are searching for other possibilities that might give us more plates in the future. Our Society is small but our hopes will always reach out beyond any visible horizon. Your editor has, in the past few weeks, visited many of the finest collections of bromeliads in the private gardens of the members of our Society in New Orleans and Los Angeles areas; it has been most gratifying to see the great interest and enthusiasm. Each garden has some individual expression of its owner and it is our hope in the editorial office that, throughout the coming year, we can give some intimate impressions of these gardens and their features along with their problems. In New Orleans, where I lectured before the Garden Club Center and also before a combined audience composed of the members of the Louisiana Bromeliad Society and the New Orleans Orchid Society, an unusual interest was shown. This interest has grown rapidly in the past five or six years when only a handful of plant enthusiasts had ever seen a bromeliad to know it as such. The old Patio Planters Society has virtually changed into the Louisiana Bromeliad Society. Their hospitality to your editor was most cordial and heart warming. In Los Angeles, the birthplace of The Bromeliad Society, interest is growing steadily and we feel sure that there is no other area where one will find as many enthusiastic bromeliad collectors or where bromeliads are featured as much in decoration and in general plant collections. There are so many enthusiasts there that it was possible to visit only a small percentage of the gardens. However, I was very pleased to see the locality set aside for the new bromeliad garden in the Los Angeles Arboretum which had its initial planting by many members of the Southern California Bromeliad Society the day after I left. This should be an outstanding project and we have great hopes for its future. 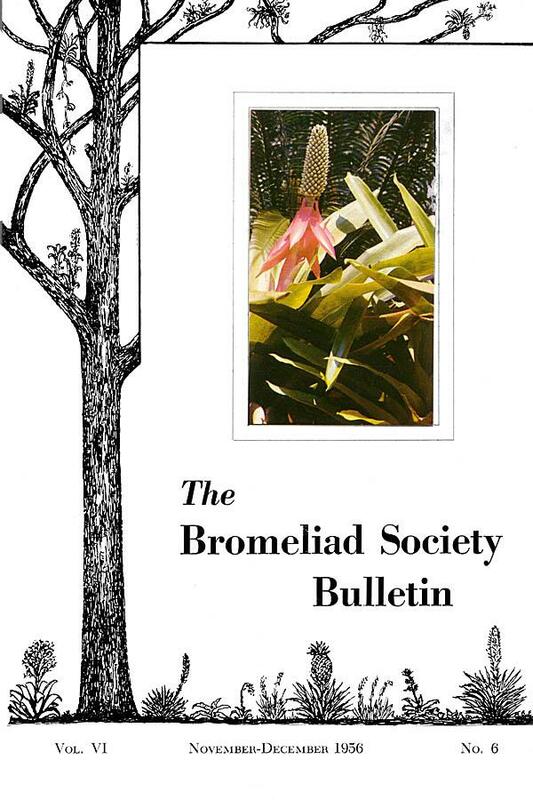 For six years the Bromeliad Society Bulletin has endeavored to keep alive an ever growing interest in this great plant family. Our purpose has been to inform and encourage a greater understanding and appreciation among the members of the Society who live in many countries. The Bromeliad Bulletin seems to roll along in spite of all the odds against us in putting it together. There are times when we do not see how we will have enough material for another issue – then, Racine and I get busy and produce something; by that time someone else has sent in an article or two voluntarily; so we seem to have enough for another few issues. We wish to thank them, one and all, heartily. We welcome knowing about your experiences with bromeliads. It is always a happy day when we can see ahead with certainty the publication of the next few issues of this periodical dedicated to the preservation of knowledge of the Bromeliaceae, a plant family without equal in its extensive variety of interest. Renewing your subscription is a helpful gesture in saying that you believe in the perpetuation of the knowledge of this unique family. It was in 1854 that Charles Lemaire created for N. fulgens Lem. the genus Nidularium of which the different species had until then been tossed back and forth between the genera Karatas and Bromelia. The name of Nidularium had been given because the flowers are situated between the leaves as in a nest. The initiative of Ch. Lemaire having been criticized by several papers on bromeliads of that period, the learned French botanist maintained his opinion, but recognizing that there was ground for certain observations, he divided his new genus into two sections: in one he grouped the true Nidularium, such as N. fulgens, N. purpureum, etc., characterized by an inflorescence bearing dispersed flowers between the bracteal leaves. Next, he gave the name Regelia to species which, like N. Meyendorffii Reg. have the flowers grouped on a simple inflorescence in the center of the bracts, in a sort of nest, more or less deep. But, when he invented the name of Regelia, Ch. Lemaire probably did not know that this word had already served to baptize certain plants of the family of Myrtaceae: Regelia ciliata Schau, etc. Horticulture had even taken over this name for the Palms, at the present time incorporated in the genus Verschaffeltia, of Wendland. Since two different plants could not bear the same name, O. Kuntze, German botanist (1843-1907) changed Regelia into Aregelia, a denomination which was accepted by Mez in his authoritative monograph on the Bromeliaceae (1935). Recently, Dr. Lyman B. Smith, the noted American authority on bromeliads, expressed the opinion that the name Aregelia was faulty and substituted for it that of Neoregelia, which, at the present time, appears to have been adopted. Charles Lemaire (1800-1871) who is referred to above, was a French botanist who lived for a long time in Belgium where he was for a time chief contributor to the "Jardinier Fleuriste" and "L'Illustration Horticole." 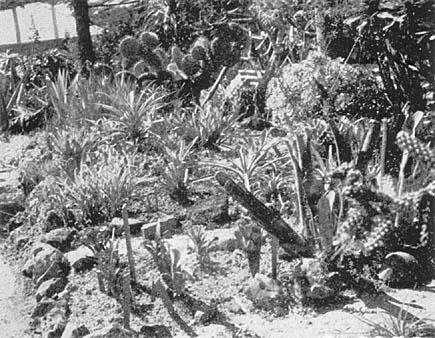 He had the reputation of having a rather quick temper which was, so said his contemporaries, related to the spiny cactus. However that may be, he was a systematizer of great worth, a wise observer, gifted with a keen critical mind. The majority of the genera and species which he created, harshly debated at first, are revealed to be perfectly correct and, at the present time, are accepted by all the modern authors. The Nidularium and Neoregelia are, in general, medium-sized plants, ornamental, with leaves green or colored, capable of holding in their cups a quantity of water, more or less important. The flowers, without being very brilliant, bring, nevertheless a note of clear color to the middle of the bracteal leaves, more or less numerous, which surround them. These occupy the center of the rosette of leaves and are decorated with tints of color, more or less vivid, varying with the species. These are the bracts, of long duration, which constitute the most ornamental part of the plant. Among the number of Nidularium most cultivated, N. × Chantrieri André is the most esteemed. It is a beautiful hybrid obtained in 1895 by Chantrier of Mortefontaine, France by hybridization between N. fulgens and N. Innocentii. It is a very beautiful plant with lustrous green foliage punctuated by black above, intense violet below, with vermillion-red bracts. N. Innocentii Lem (Karatas Innocentii Ant.) introduced from Brazil in 1855, has beautiful green leaves, tinged with reddish-brown, dark-red on the underside, softly and finely toothed, with brilliant orange-red bracts and white flowers. As for N. fulgens Lem. (Karatas fulgens Ant. Nidularium pictum Hort.) equally well esteemed and introduced from Brazil in 1854, it is a dwarf plant with showy leaves, arched, tough and hard, indented, of a lively, brilliant green, spotted with dark green. The bracts are brilliant scarlet and the flowers violet, tinted with red. Another interesting species (N. rutilans Morr. Karatas rutilans Bak.) is a handsome plant with an utricular rosette at the base, long narrow leaves, almost free from indentation, [marginal spines] lively green, with the spots darker, and short, bright crimson bracts surrounding rose-salmon flowers. The genus Neoregelia is, from the cultural point of view, more important than the Nidularium. The species most cultivated is certainly Neoregelia Carolinae L. B. Smith, known chiefly under the name of Nidularium Meyendorfii Regel. Introduced from Brazil in 1857, it possesses numerous synonyms, of which we shall point out only the principal ones: Aregelia Carolinae Mez., Bromelia Carolinae Beer, Billbergia Carolinae Hort. van Houtte, Karatas Carolinae Ant., Nidularium Carolinae Lem., Nidularium Meyendorffii Reg. (Color plate in l'Illustration Horticole of 1860) . This species is, at Ghent, the object of a very important culture in view of the production of young plants valued by florists for the decoration of apartments where they retain their freshness for a long time. It develops a short and dense rosette composed of a score of stiff, tough leaves, erect in young plants, length 25-35 cm., width 3-4 cm., brilliant clear green, uniform on both sides, finely toothed. Bracteal leaves are brilliant vivid red, and the flowers white with lilac at the tip. Under the name Nidularium Marechalii Hort. Makoy (Regelia Marechalii Lindm. ), there is cultivated on a large scale, also in Ghent, a plant, the origin of which is obscure, even though it had been put into commerce by Jacob Makoy of Liege. We believe it to be only a variety of Neoregelia Carolinae from which it differs only in that its stem is shorter, its leaves shorter and broader and by the rose coloration of its bracts. Neoregelia Carolinae and its variety Marechalii have been found to be easily modified, and from them have come, through various horticulturists of Ghent, different variations, not so manifest in the form of the leaves, but more particularly in the number, the coloration and the disposition of the bracts. These bracts are usually three or four, sometimes five, in number, among the seedlings they are generally more numerous: six or eight, sometimes ten, their color varies from pale rose to dark red in passing through the whole gamut of intermediate shades, even going sometimes to vermillion and dark violet. A very important variation was the appearance of a central longitudinal striping. In Neo. Carolinae, it is known at Ghent under the name of Nidularium Meyendorfii folis variegatis; it was obtained by M. A. Gyselinck, a horticulturist of Meirelbeke, and shows its leaves ornamented by a wide, central band, clear yellow, passing to white towards the extremities; the bracts are red, shading to rose. N. Marechalii has given N. Marechalii tricolor; this form obtained by M. Declercq van Ghysegem, of Ledeberg, presents the same striping, but the yellow is darker and the bracts are tinted with bright red. If Neoregelia Carolinae is the most important species of the genus, the other species merit equal consideration by horticulturists. For example: Neo. princeps L. B. Smith (Aregelia princeps Mez, Nidularium princeps Morn, Karatas princeps Bak. ), a plant with short wide leaves, glaucous green, pruinose on the under side, and with short bracts, wide and showy, bright rose with violet flowers. Neo. concentrica L. B. Smith (Aregelia concentrica Mez, Nidularium acanthocrater Morn, Karatas acanthocrater Bak.,) is a strong, thick-set plant with a tight rosette of broad, tough leaves, bordered with black spines, pale green, spotted, chiefly in the young plants, with dark brown, almost black, the reverse side being streaked with silver-grey. The bracteal leaves, successively shorter, take on, in the center, a pale, yellowish tint, strongly shaded with rose and violet. Two varieties are distinguished: Proserpinae differs little from the type, with yellowish-white bracts tinted with violet; Plutonis has dark violet bracts and leaves less broad. With this latter species one can compare Neo. coriacea L. B. Smith, but it differs from it by its dark green leaves, more or less tinted with violet-hued purple, and by its dark metallic violet bracts. We note also Neo. marmorata L. B. Smith (Aregelia marmorata Mez), a beautiful species with large, pale green leaves, marked on both sides with large, confluent reddish-brown spots, bright red at the tip. In order that the color of the leaves may attain its full intensity, the plants must be cultivated in poor soil, or better, on logs suspended from the roof of the glasshouse. Neo. spectabilis L. B. Smith has upright leaves, narrow, almost spineless, of a lively green with a spot of carmine at the tips and some transverse whitish bands on the underside. The bracteal leaves are not colored and the plant does not demand the lighting to be as bright as for the preceding varieties. Other species are still cultivated under the names of Aregelia (Nidularium) Binctii Mez, Areg. Makoyana Mez, (Nidularium sanguinarium Hort.) etc., but they are chiefly collectors' items, which, although interesting, are met with rarely in commerce. There are also some hybrids, notably, N. × Chantrierii André, already described, and also those obtained by M. L. Dutrie under the names of Aregelia amabilis 1939 (Marechalii × concentrica), a medium-sized plant with short, broad leaves; A. × decora (concentrica × princeps), broad leaves, green, with darker spots, rose bracts. It won a certificate of the first class with congratulations at the Meeting of Ghent (July, 1939). Some of the recent Bulletins have contained various proposals for arranging bromeliads on pieces of drift wood. For some time in Vienna a form has been developing which absolutely differs from the usual manner by which bromeliads are fixed on trunks of trees or smaller pieces of wood. As a support for this new form of planting, the barks of two kinds of oak are used –Quercus suber or Quercus cerris. When finished and planted with bromeliads, these pieces of bark are suspended like framed pictures on a wall in a suitable place in the living room or sun porch. Of course, these "living pictures" must be hung close to a window or where they can catch enough light. Fortunately, many bromeliads are quite content with dim light and can thrive without direct sunlight and not lose the variegated coloring of their leaves. These hanging bromeliad pictures have the great advantage of allowing for the maximum growth of the plants and yet taking but little space. The same bromeliads cultivated in pots on window sills or on flower tables are always exposed to the danger of having their leaves injured, especially in small dwellings. Some bromeliads are not grown because of their thorns and the injuries caused by touching them. The suspended living bromeliad pictures give not only a wonderful ornament to a room but also prevent both children and adults from being hurt by the sharp leaves. One or more bromeliads of the small and colored-leaf forms (Cryptanthus, Neoregelia, Tillandsia, Nidularium, Vriesea) can be fastened to a piece of bark. The roots of the chosen plants should be carefully covered with potting material, around which is put a layer of sphagnum moss. This prepared ball must not be any larger than is absolutely necessary and must never make the plant unsightly when it is arranged on the cork. It must never produce the effect of being clumsy and heavy. To keep the ball of roots firm, it should be wrapped around with a thin wire of lead and tightly fastened through holes which have been drilled beforehand into the cork. Before the finished bromeliad picture can be fastened to the wall, the rootball should be soaked with water. The watering of the plant will depend upon its place in the room, the weather, and the temperature. Two or three times weekly is usually the number of times necessary. Watering can easily be done by taking down the bark and dipping the whole plant into a vessel filled with water. The "face" of the picture should be allowed to soak in water from fifteen minutes to a half an hour – the back side of the cork being on top and out of the water. The vessel used must be so large that the leaves are not broken when the plant is dipped into it. A bath tub could be used if one does not have a large enough container. After each watering, the plant should be allowed to dry so that all excess water is drained off before the arrangement is returned to its place on the wall. When grown in the house, bromeliads are used for the beauty of the design and coloring of their leaves, rather than for their bloom. Bromeliads can be grown in this manner for several years without replacement. Bromeliads can be combined with other plants having brightly colored leaves – Ruellia, Ficus stipulata, Tolminea menziesii, Chlorophytum, Peperomia, Oplismenus, and others – but usually these plants will last only from five to ten months. An assembly on bark from the cork-oak, fitted together, shingle-like, with additional pieces of bark properly trimmed to provide containers for planting the bromeliads and other epiphytes. If the backside is left flat it can be fastened or stood against a wall. The dried seed frond of the Portea petropolitana var. 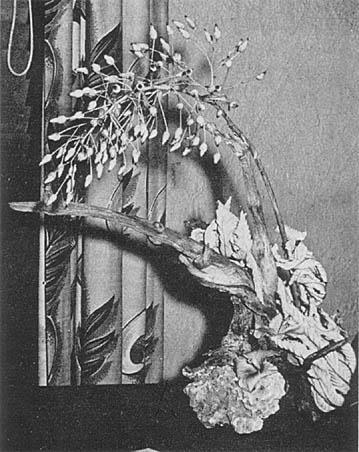 extensa was used in an arrangement of driftwood, cecropia leaves and light lavender hibiscus for the Halifax Chapter of the Hibiscus Society, held in August 1955 in the Princess Issena Hotel at Daytona Beach, Florida. The bromeliad material "stole the show" from the three hibiscus flowers nestled in the porous driftwood. The subtle coloring of lavender and green in the Portea inflorescence was a charming repetition of the rare lavender hibiscus, "Blue Boy", a recent hybrid made at Merritt Island Nursery. Amazingly, this Portea inflorescence lasted all summer. A professional arranger was delighted with such long lasting material and used it in demonstrating arrangements for the Palmetto Club in Daytona Beach. DON'T MISS the full page in color of nineteen handsome bromeliads in the December 1956 HOUSE AND GARDEN with its accompanying article on how to create a Bromeliad Tree. 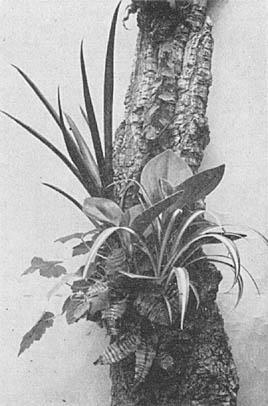 It is well illustrated in a black and white series of "how-to-do-it" photos, although the finished tree is a disappointment in its lack of variety in size and form of bromeliads. Ed. Some of the plants that we now call Porteas have had a rather varied "name calling" career. Exclusively Brazilian there are only five recognized species and two varieties. Outstandingly decorative some of them should be much better known horticulturally, and since this is the one hundredth anniversary year of the genus, we feel it is fitting that plant fanciers become more familiar with its history. The first plant to be called a Portea was found in Bahia, Brazil by Blanchet. It was botanically described by C. Koch in Ind. Sem. Hort. Berol. for 1856 and therein named Portea Kermesiana. To confuse the botanical history of the genus Portea a little more, we find that Gardner collected a plant in the state of Minas Geraes about 1840 but it must have laid in the herbarium, unnoticed, for forty-nine years, as it was not identified until 1889 at which time it was named Portea Gardneri Baker. Although this plant was, no doubt, the first Portea ever to be found, it was not the first to be named. Later, in 1892, Baker renamed this plant as Aechmea microthyrsa; then, in the same year, reconsidered its validity and put it in another genus, naming it Streptocalyx orthopoda. In the same year Carl Mez, in trying to clarify the confusions, renamed it again and placed it in the genus Portea, returning for the species name to that of Wawra, when he named it Ae. Noettigii. The Mez description of Portea Noettigii was published in Martius Flora of Brazil III. 3. (1892) 296. But, this was not the final decision (!) Fifty-one years later, in 1943, it received its latest, and we hope its final name, of Portea petropolitana var. noettigii (Wawra) L. B. Smith because Dr. Smith considers it only a varietal form of the Portea petropolitana. The original type species of Portea petropolitana (Wawra) Mez (first described by Wawra as Aechmea petropolitana in 1880) is now listed as Portea petropolitana var. petropolitana to indicate (according to the new nomenclatural rules) that it was the first one of this species to be named. This species is now blooming profusely in the garden at the Bromelario in Orlando, Florida and is pictured in accompanying photo. The author found this species in 1939 growing in the littoral within a few hundred feet of the Atlantic Ocean, in full sun and sand, in the state of Espirito Santo as well as in the interior. It is a very robust plant. The stiff rosette of prominently spined leaves form a plant which often reaches from three to four feet in height when in bloom. 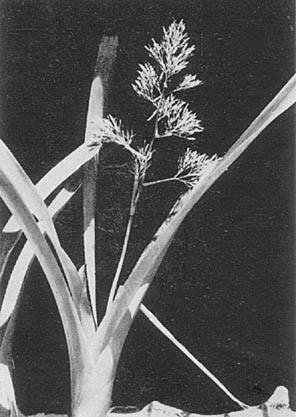 The flower head is a rather compact, much-branched cylindrical panicle about twelve to eighteen inches long and continues to produce flowers from mid-October until January. The delicate white-lavender petals are held tightly in a cup of strongly spined sepals which are united at their bases and are barely distinct from the ovary. Sepals and ovary are a delicate pink-orange in color. This lovely combination holds a lavender pistil emerging just above the barely open tube of lingulate petals. Each petal holds two nectar scales at their base. Unlike most bromeliads the old inflorescences do not decay and fall away after they have ceased to show any life, but, instead they persist for three and four years; they cannot be pulled out but must be cut off if removal is desired. However, they are not unattractive and actually make a dried arrangement in between the annual flowering periods. It is a lovely addition to any tropical garden. Another variety is also most attractive. Portea petropolitana var. extensa L. B. Smith (see p. 88 this issue; also on cover of Brom. Bul. Vol. 1, No. 2, March-April, 1952) is perhaps the most graceful and delicate of all the Porteas. We first discovered it in a mangrove swamp area near the sea at Victoria in Espirito Santo, Brazil. It was growing in masses attached to the mangrove roots barely four feet above the high tide mark. The first plants we saw were not in flower and little did we realize what a beautiful bromeliad this was until we later found plants in flower growing on rocks near the inland bays of the littoral. The light yellow-green leaves of this variety are not as stiff as those of the other Portea species and, although the leaf margin spines are large and jet black, they are really not very stout. With a charming open spray of flowers of lavender petals and apple green ovaries, this variety extensa is one of the most attractive additions to a bromeliad collection or garden that one could wish for. Early in spring this plant brings forth a spray of delicate flower buds, each on a long pedicle that day by day continue to grow larger and more colorful. A month later the flowers, now ready to show their lavender petals, a few each day, continue to bloom for at least two months. Gradually the fruits enlarge and as they grow heavier the spray, now three feet high, nods gracefully above the narrow leaves and it remains a conversation piece until December when the berries will turn a dark purple. Rarely have they produced seeds unless they have been pollinated by hand or by the humming birds, although the fruits will be full size and solid whether it is with or without seeds. They have a pleasant sweet fruity odor and taste when crushed. Portea leptantha Harms was discovered by B. Pickel in Pernambuco in 1929. Harms describes the color of the flower as brick red. The author collected this species in 1948 in the states of Paraiba and Pernambuco; a fine specimen of this plant has been in flower the greater part of this past summer (1956) in our Florida garden. The petals are yellow and the ovary orange-yellow. So far as we can ascertain this species has never been in cultivation before. The plant reaches a height of four feet and as shown in the accompanying photo the inflorescence is corymbose (composed of clusters) and each cluster contains many flowers on small branches. The individual plants have eight to twelve lingulate (tongue shape) stiff leaves with spiny margins and a stout terminal spine. They were growing on rocks in large clusters in full sun. Portea filifera L. B. Smith was discovered in Bahia by Racine and me in June 1939. This was the first Portea that we had ever seen, and, incidentally, it is the least attractive, from a decorative standpoint, of any of the species in the genus. The stiff, dark green leaves reach a length of three feet but the inflorescence which is subdense and cylindrical, contain many small flowers. Portea Silveirae Mez was named for its discoverer A. A. da Silveira who found this species in Minas Gerais about 1900. The plant is a very rugged one similar to P. petropolitana var. petropolitana. The dense spike of flowers with reddish-lavender petals is a very decorative one and the writer took this species in both Espirito Santo as well as Minas Gerais in 1939 and 1940. All of the species of Porteas bear their flowers on thin stems or pedicels and they have very small thin flower bracts at their bases but the colorful primary bracts at the base of each branch and all along the scape are quite ample. A corner of Muriel Waterman's garden. In years past cacti and succulents commanded most of this space; then some bromeliads began "creeping" into the garden and now (since this picture was taken) only bromeliads are there. It has been a complete transformation, and now contains the largest bromeliad collection in New Zealand as well as in all of "Down Under." I have about three-fourths of an acre under the hoe with narrow paths in all directions, but quite a portion of this is taken up with cactus plants, of which I have small ones such as Mammillarias, etc. and tall ones such as Trichocerei and others as high as fourteen to eighteen feet, also other succulents such as Euphorbias, same sizes Aloes and Agaves, Echeverias, Graptopetalum, etc. But my pride of all are the spaces with bromeliads. I grow outside, all the year, practically all bromeliads with tough leaves; tender leafed ones I have in long boxes on the benches in the glasshouse. This is thirty-six feet long and twelve feet wide by eight feet in front. All the frontage is formed by let-down windows; these allow the entire space to be open to the air (when desired) from bench to roof; it is covered with small-mesh wire netting to keep out birds, opossums, etc. These windows pull up to four different heights before reaching the roof, so I can regulate the wind blowing on the plants. During our winter (May-July), if it is mild, none of the windows are up more than half way. I have the same windows on all the other sides and have always at least one on each side open so that there is always moving air. Sometimes in winter we have a truly piercing wind blowing off the snow-clad mountains and glaciers. In summer I water the plants in the glasshouse every other day, letting some water run down to the roots as well as liberally sprinkling the leaves. In winter about every four days, usually only sprinkling the leaves. The soil for these boxes is pure leaf mold (we have quite a stretch of bush (or forest) on our property) mixed with a sprinkling of meat-meal – about a quart measure leaf mold to a small closed handful of meat-meal. (Slaughterhouse waste, ground up and cooked.) This meat-meal I had left over when I stopped feeding mash to the bantam chickens, hence my first using it. I found it did good and no plant suffered, so have continued ever since. I have used Zest for watering, but not on the tender leaves as I think it is apt to burn them. Zest is an immediate leaf-feeding concentrated plant food. For the wee seedlings which I received from Germany, I mixed the upper soil with the liquid Zest to a firm consistency and "sat" each of the 80 seedlings on this, drawing the leaf mold and meat meal around the "neck" and they responded unbelievably! The temperature in the winter is around 40° F. nights, and goes up to 75° or 80° F. in the middle of the day when the morning sun has shone in. My Dingle Dell I have just made. I put a small opening into the shrubbery, put wire netting and hessien all round a portion, using tree trunks as posts where possible. One is a Silver Tree Fern, others are: a Black Punga, a Ginko (maidenhair tree) and a Camphor Tree. The background is quite effective, an Ochna, a Grapefruit, a Rhododendron, an Erica, a Crab Apple, a Pepper tree and so on. When I planted the bromeliads here (as elsewhere in the garden) after having dug down across the whole area about eight or nine inches deep, I made a bowl-shaped hole, part filled it with leaf mold and meat meal, put the plant in and more soil, and then drew the removed soil over the top as leaf mold is so light. The bromeliads respond wonderfully and look so bright and shining. Plants in other parts of the garden have less shade, so Nidulariums and variegated-leafed plants have to go wherever there IS shade. Long ago I planted a Norfolk Pine and three Cabbage trees to make a certain amount of shade but some plants have to have sun all day and do not seem to mind such as most Billbergias, many Aechmeas, Hechtias, Puyas, Bromelias and such like. Actually, here in Milford, we are lucky. Since we are near the sea and also near a large lake we seldom get a frost below 30° F., but further south they get terrible frosts and snow. Around Auckland in summer in the shade the heat is well into the 90s and the humidity, which is awful for us humans but lovely for the plants, is frequently 95% to 99%. I do very little replanting. When, in the spring, I take the new stronger leafed plants from the boxes in the glasshouse and plant them outside, I add some more leaf mold and meat meal to those boxes (I use very few pots) and about once in three or four years I add some to the occupied boxes (Guzmanias, for instance I find will not do outside) and three or four times a year I give each box a good soaking with Zest, but that is all I do in that line. The plants are utterly happy; it is seldom I lose any. Now and again I miss one or two after a bevy of unknown visitors!! I get a lovely lot of "pups" off most of the bromeliads in the glasshouse and garden; a very few are difficult and seem to grudge me any increase. In spring and summer I usually plant the separated "pups" in leaf mold and meat meal alongside their parent if outside and they do not seem to mind the break at all. I have thirty-five genera and 325 different species and I love every one of them! A cluster of Ochagavia Lindleyana (Loin,) Mez growing in Mrs. Waterman's garden in Auckland, N. Z. To write anything at all about Ochagavia Lindleyana is, mainly, to clarify the nomenclature – and that is a long botanical task – its history being quite complicated. Perhaps many people now have this in their collections under various different names, such as Bromelia carnea Beer, Rhodostachys andina Phil., Bromelia longifolia Lindl., Hechtia Elemeti Hort., Ruckia Ellemeti Regel, Pourretia argentea Hort. etc. Other names such as Fascicularia bicolor, (or Bromelia bicolor), Deuterocohnia, Pitcairnia or Puya, are all reckless applications of certain familiar names to a spiny leaved plant. Horticultural confusion, generally, cannot be accurately traced, whereas botanical confusion is all recorded in legal form if you can obtain all the books. I have five books (and as many dictionaries) for reference in front of me . . . and I have to read in five languages to get the many clues. I should have at least six other books at my elbow and should be able to read all these languages fluently to really know what has been written about this plant. It becomes as exciting as a mystery story – with a plot unfolding – once you are in to it. 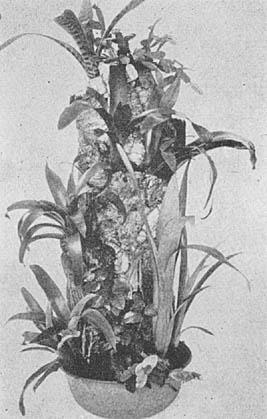 This bromeliad was introduced (according to Baker in his Handbook, 1889) into cultivation in England in 1850 or earlier, but was shown for the first time in public at the London Horticultural Society Exhibit in August 1851 (according to Ed. André in Rev. Hort. 1885, p. 540). Thus it was grown and shown before it had been botanically described (an unfailing cause of nomenclature confusion) – an adventurer from England having sent home seeds or plants from northern Chile. Mr. Lindley immediately published a botanical description and drawing of this plant in Paxton's Flower Garden II, 1851-52 under the name Bromelia longifolia, it being described from a plant belonging to Mr. Rudge; whereas two years later in 1853, Monsieur Lemaire, in Jardinier Fleuriste decided that the first description was wrong and (having good botanical argument) changed the species, naming it for Mr. Lindley, the man who first had described it. Then, Herr Beer, in Germany, came along and decided that this too, could not stand, and published in his Die Familie der Bromeliacee in 1856, the argument that it should be called Bromelia carnea. Meanwhile, Sr. R. A. Philippi, who may not have read all these previous publications, being in Chile, (and a hundred years ago that was far away) published in Anales de la Universidad de Chile, (May 1856, p. 168), the description of his new bromeliaceous genus, Ochagavia, with a single species O. elgans. (For the following in either translation or paraphrase I am indebted to Lyman Smith and G. Looser from their paper "Notas sobre las Bromeliaceas Chilenas" in Revista Universitaria No. 8, Jan. 1934, pp. 1075). In September of the same year, 1856, Philippi repeated this publication in the German magazine Botanische Zeitung XIV, 647. A year later the same naturalist described this plant in the publication Linnaea XXIX, 57 (1857-58), as Rhodostachys andina showing that the only difference between this latter one and his first one, Ochagavia elegans, was that Ochagavia had the more caulescent habit and that the epigynous tube (ovary) was larger. But, as Smith and Looser say, these characteristics in the rest of the family show the difference between species and not between genera. Therefore, the name of Rhodostachys must be suppressed. A single plant of Ochagavia Lindleyana. The identity of these two genera had already been recognized before (Smith and Looser's publication) by Carl Mez in his monograph of the family, but Mez did not establish that the name, Ochagavia, was a year older than Rhodostachys and gave his preference to this last named genus, changing unnecessarily the name of Ochagavia elegans to Rhodostachys elegans. Neither did Mr. Riche (in Grundzuge de Pflanzenverbreitung in Chile p. 67) separate the two genera. Only Harms (in Naturlichen Pflanzenfamilien, Engler-Prantl, 2, XV, 1930) maintained a separation of the two genera. Accordingly, the Harms Ochagavia became a monotypic genus endemic to the Island of Juan Fernandez off the coast of Chile, while Rhodostachys was endemic to the continent, but to Smith and Looser there seemed to be no foundation for this conclusion. Edouard André, in Revue Horticole, 1885, p. 540, accepted Rhodostachys andina in view of the fact that Philippi had so named a plant answering the original description, but André admits that there were numerous plants about Europe appearing to resemble this plant all under different names, it being sold at the nursery of M. Vausseur, horticulturist in Tours under the name Pourretia coarctata, a name having no legality in connection with our plant – only a horticultural mistake. Otto Kunze seems to have been the first one who made note that Ochagavia had chronological priority over Rhodostachys in Post.u O. Ktze., Lex. Gen. Phan. 394 (1904), but he made no combination. Smith and Looser give the long list of literature and its many authors on this and other Ochagavia species cited by Mez in his first monograph in 1896 (DC Monogr. Phaner. 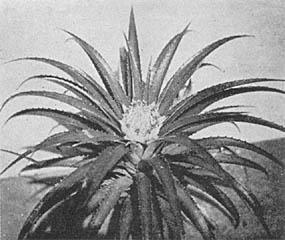 IX, 1896, p. 338) but we are concerned only with the plant that became Ochagavia Lindleyana. In 1896 Mez, who had been digging seriously into the Bromeliaceae as a doctorate thesis project, published his change in genus to Rhodostachys carnea basing it on the second description of Philippi and the species on Beer's B. carnea. 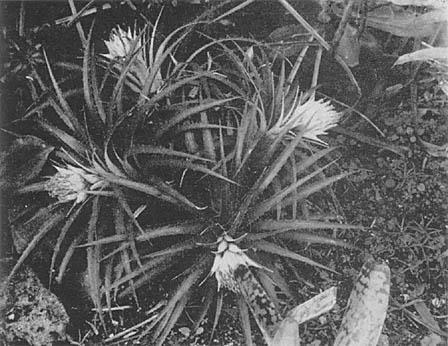 Then, later, in 1935, he published, in his more complete monograph, Das Pflanzenreich, his final conviction which made another nomenclatural change; he went back to Lemaire's Bromelia Lindleyana for his species and to Philippi's Ochagavia elegans for his genus name, resulting in the new combination Ochagavia Lindleyana, a name now accepted by Lyman Smith (and the rest of us) until some one else finds more convincing proof that it should be otherwise. In appearance this is one of the most charming of the bromeliads when in bloom. Those who have had the pleasure of seeing it in "full dress" have stated that the ovoid shaped flower head, on a short peduncle, is covered with rose colored bracts which are a more intense color than that of the pink, or "tender rose" petals as André describes them. Elsewhere André has said that the petals are a blush of rose-lilac. Muriel Waterman (who cultivates the plants in her N. Z. garden) says the flower head is "the size of a tennis ball covered with delicate pink-lavender bracts all covered with thick powder." Bright yellow stamens, protruding beyond the petals make this a dazzling sight to behold. Its leaves, glaucous green, are numerous, stiff, spiny, long and in the form of a rosette out of which emerges the "tennis ball" inflorescence. It has the clustering habit and it is not unusual for several heads to be in flower at once as in the accompanying photo. There is only one way to make a really scientific determination of this confused nomenclature, and that is for one person to collect the species in their original locations as well as representatives from the nurseries, especially from those in Europe, and assemble all these under the same conditions, then wait a few years, note the differences and similarities and send all specimens to Lyman Smith. This is part of the purpose Mulford Foster has had in collecting endless bromeliads which are not for sale – they are for nomenclature clarification – a task that takes many years to accomplish.